There is an obvious lack of desserts on my blog. For one reason, I prefer savory over sweet any time, any day. But the other reason is that if I do make dessert, I’ll eat it. I mean, I’ll finish it. When I made the mille crêpe cake for my birthday a while back, my husband and I both had a piece, and then I asked him if he’d want more. He shook his head no. He can get a little carried away as well, like when you get a hankering for that dessert that you know is in the fridge, and it’s 9 o’clock at night. So into the garbage went that beautiful cake. I know, a waste, but I don’t really know anyone who wants to eat desserts either. Recently I saw a Strawberry Slab Pie online. It was probably on Pinterest, and when I clicked on the pretty photo it went to the Country Living website. It’s a strawberry pie baked in a jelly-roll pan and decorated with flowers. A fruit dessert is typically healthier than, say, a chocolate cheesecake to have sitting in the refrigerator taunting me at night. But what intrigued me about this pie is what the pie-maker did with the flower cut-outs of crust. As with my mille crepe cake, this would be another baking/pastry challenge for me, because I’ve never done much more with pie crust dough than lattice. First I had to locate some flower cookie cutters, which I found on Sur La Table. What I also like about this pie is that the filling is basically all berries, plus a little sugar and cornstarch. None of that goopy pie-filling-like stuff. To make the pie, preheat oven to 425°F with the rack in lowest position. 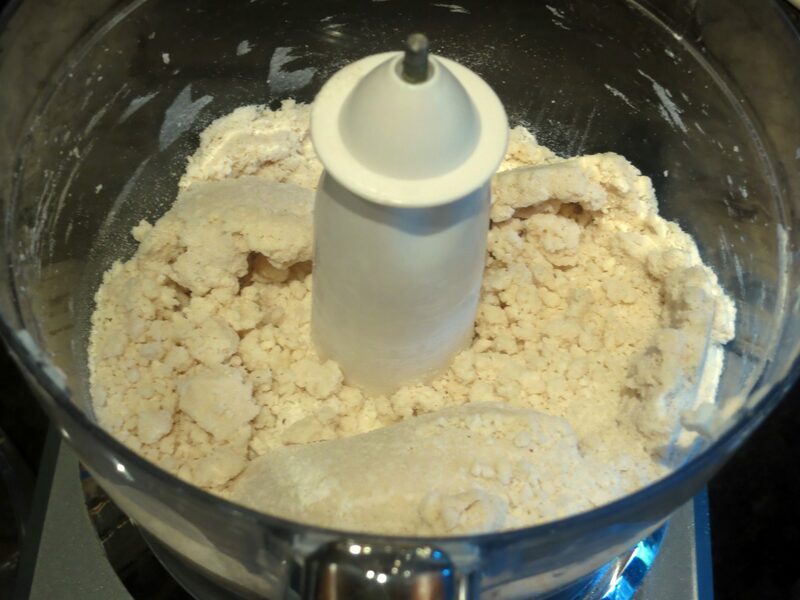 On a lightly floured surface, roll 2 recipes of dough. Transfer to a pan and trim. Crimp and chill. I obviously used a shallow, large, round terracotta pan to make this pie instead of a jelly-roll pan. 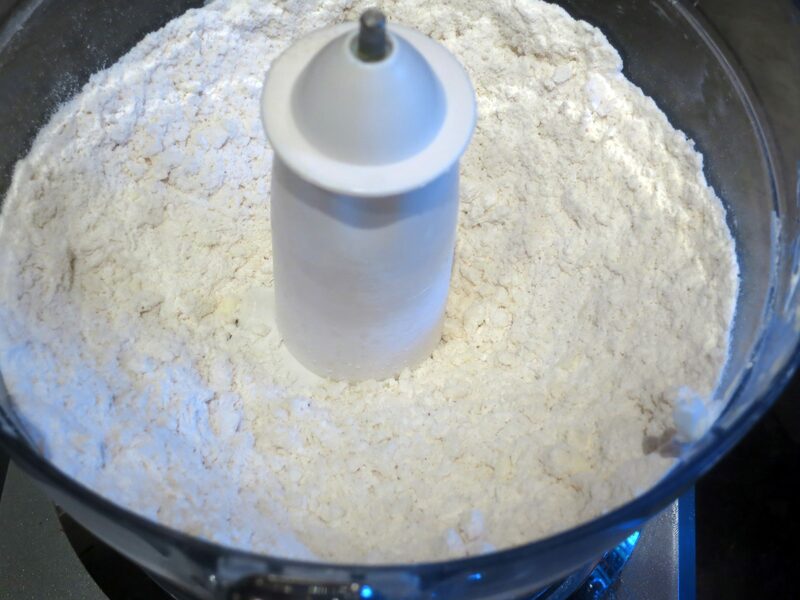 Roll remaining dough to 1/8- to 1/4-inch thick. Cut dough with assorted flower-shaped cutters. Transfer flowers to prepared baking sheet, and chill. Stir together sugar and cornstarch in a bowl. Add strawberries and blueberries and toss gently to combine. 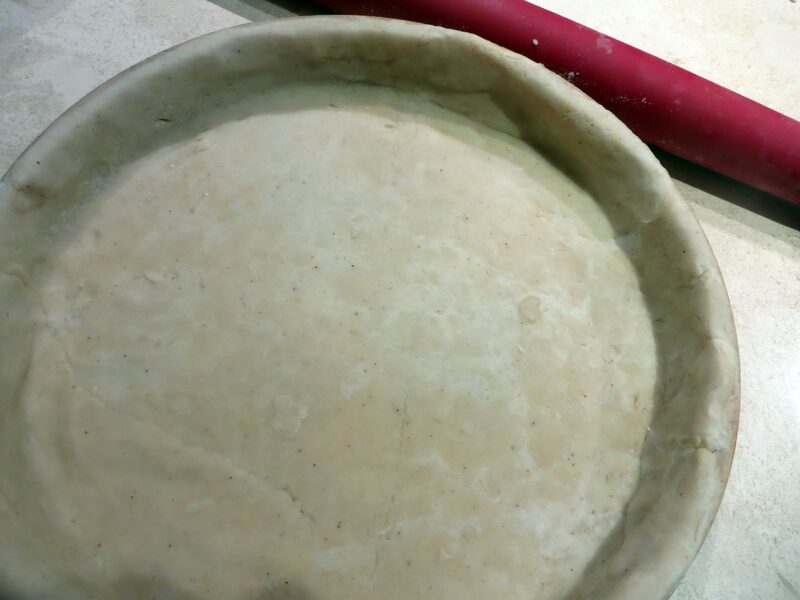 Transfer to bottom crust, packing tightly into pan. Whisk together egg white and 2 teaspoons water in a bowl. Brush dough flowers with egg wash. Arrange dough flowers, slightly overlapping, on top of berries. Brush edges of dough with egg wash. Freeze 20 minutes while preheating the oven to 425 degrees F.
Bake the pie in the middle of the oven for 50-60 minutes. I had to adjust the temperature after 30 minutes; my crust browned too much. If this happens, place a piece of foil over the top of the pie and continue baking at 400 degrees. Remove the pie from the oven and let cool until set. Serve warm or at room temperature. I served the pie with whipped cream. I baked some pie-crust cookies separately, and stuck one in the whipped cream for decoration. I’m obviously not a stylist. So I ate it instead. 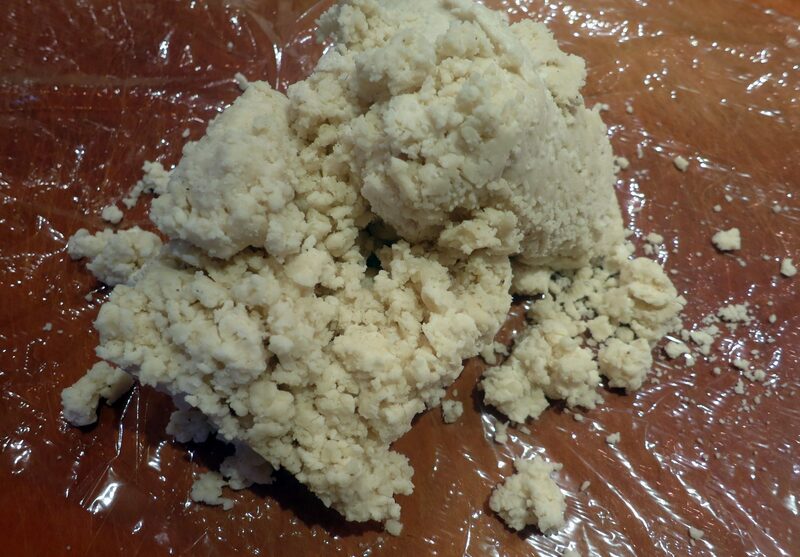 So, although a bit challenging but not stressful, I will leave the fancy pie-crust makers to their fancy pie crusts. The good thing is that the pie itself was very good. I love that it’s just about crust and berries. Check out this pie from Williams-Sonoma. When I make a pie crust for even the simplest of pies, I like to change things up. There’s nothing quite so perfect as a pâte brisée, but when you can also add ground nuts of various kinds, and flavorings like rum and cinnamon, the crust pushes the pie over the top! For Thanksgiving, I only made one pie, since there were only four of us, and that was a pumpkin pie. I did add some rum-soaked raisins to the pie as well. 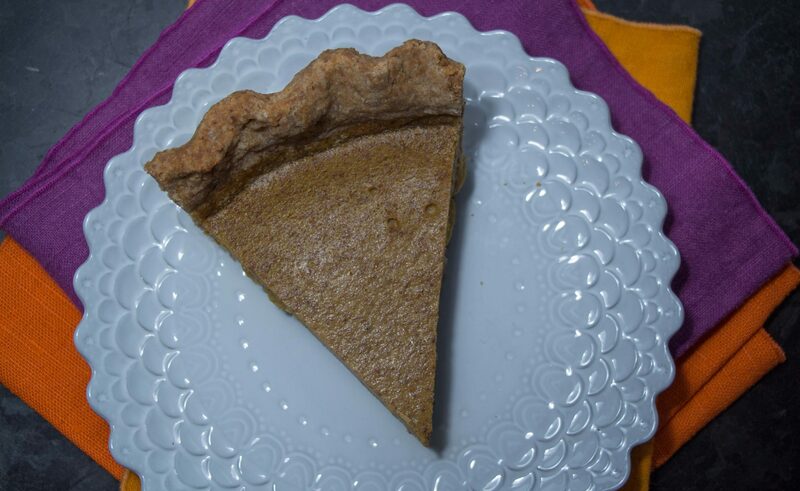 A good pie, as it turned out, although not necessarily better than a traditional pumpkin pie, which we all love. I just wanted to literally spice up the crust. 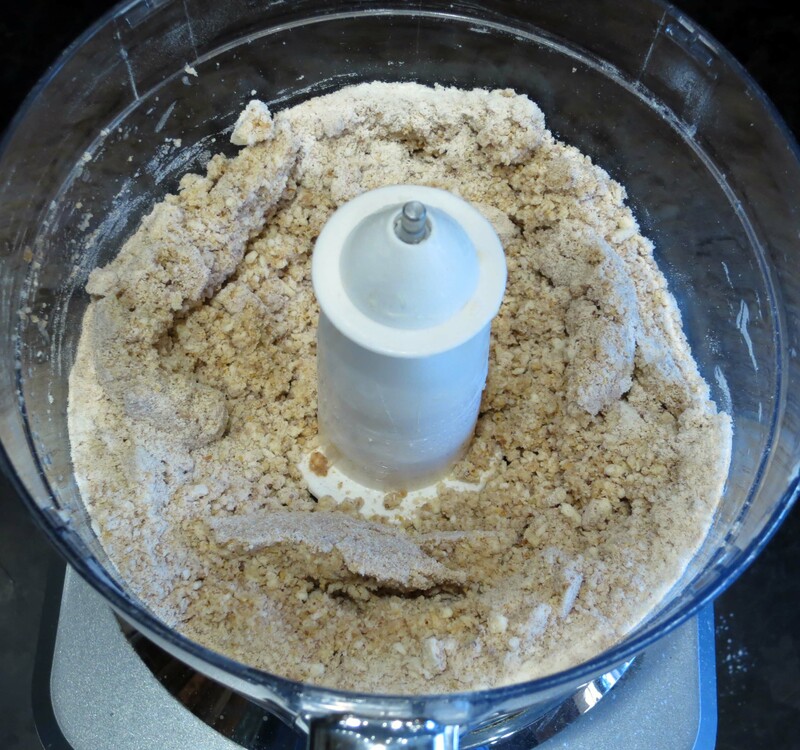 So, I chose to make a hazelnut-based pie crust. 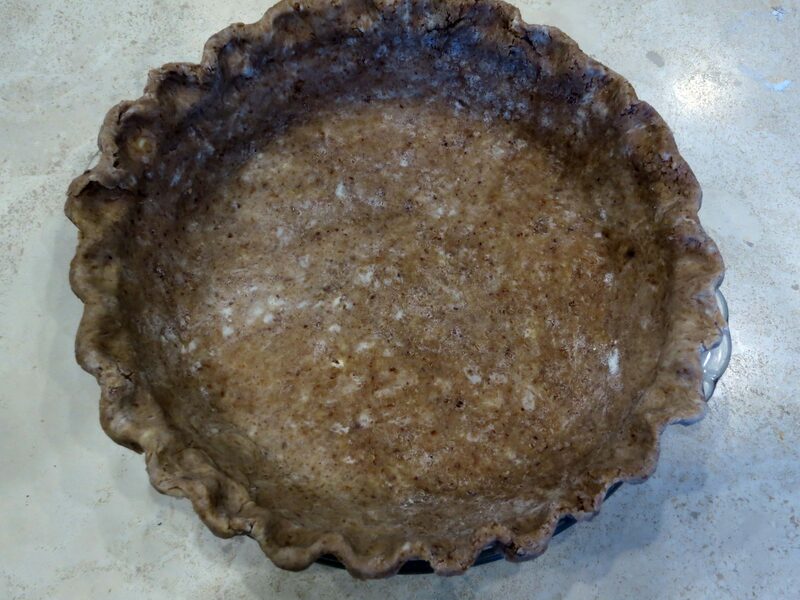 In my tutorial for making pie crusts, I mentioned adding nuts as an option for introducing different flavors as well as textures into a basic pie crust. It’s just so fun and easy. 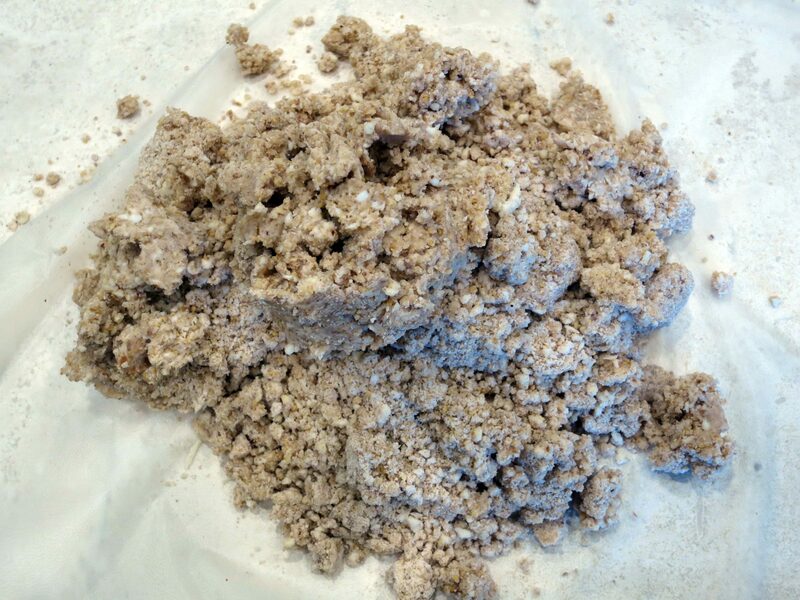 The only negative in adding ground nuts to a traditional flour-based pie crust is that the dough is more on the crumbly side, and is a tiny bit harder to work with. However, if I can do it, anyone can as well. 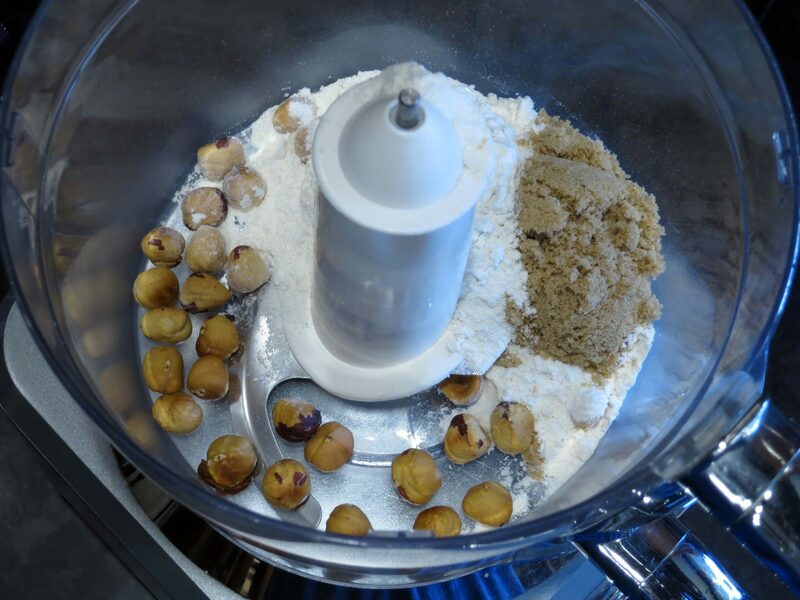 Place the hazelnuts, 1/2 cup of flour and the brown sugar in a food processor jar. Process until the hazelnuts are very fine. 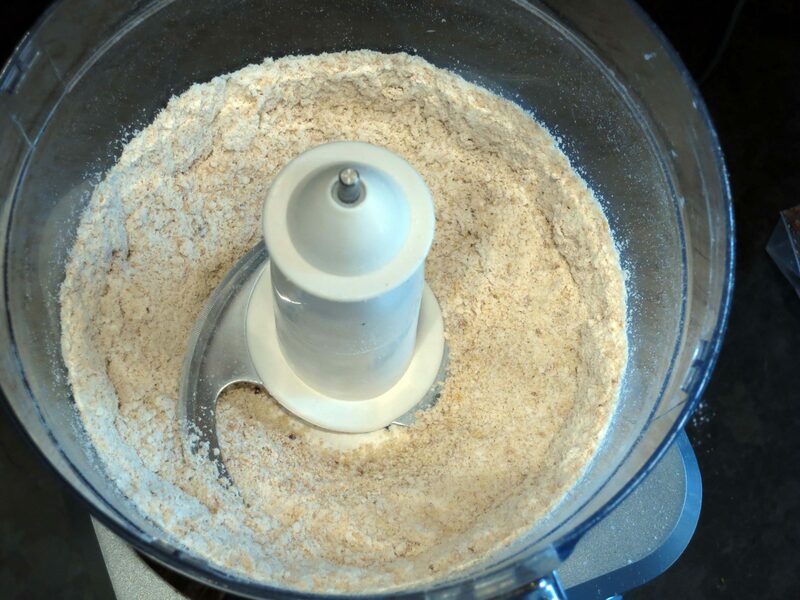 The addition of the flour will keep the nuts from becoming nut butter. 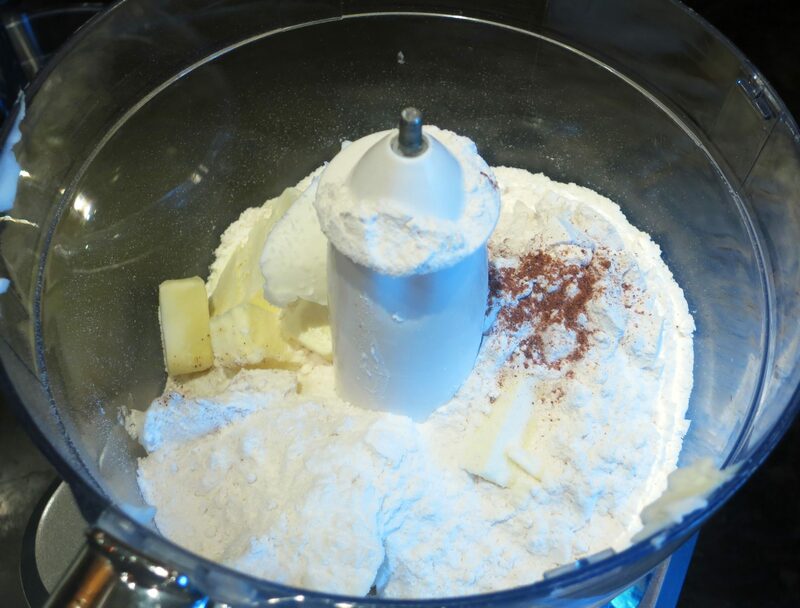 Add the remaining flour, cinnamon, and the rum. 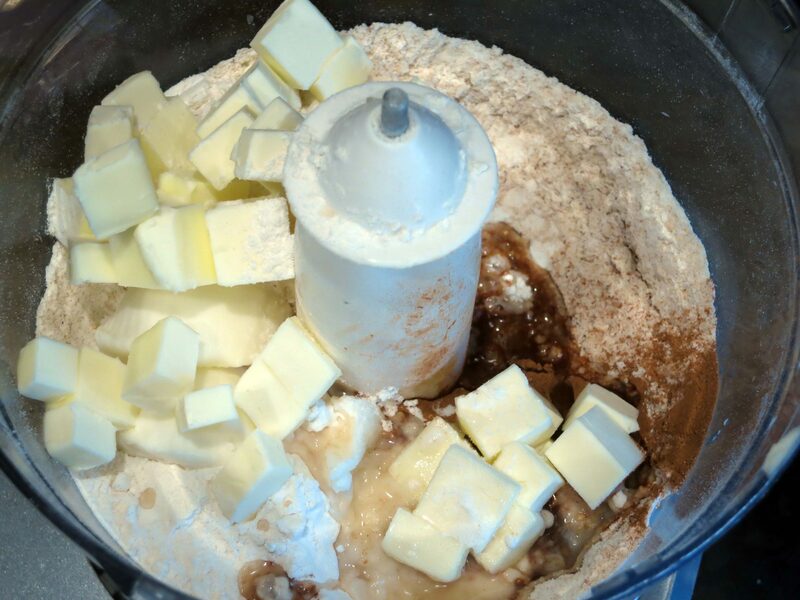 Then add the shortening and butter and process just a little. Then, adding icy cold water as needed, continue processing the dough until it balls up. 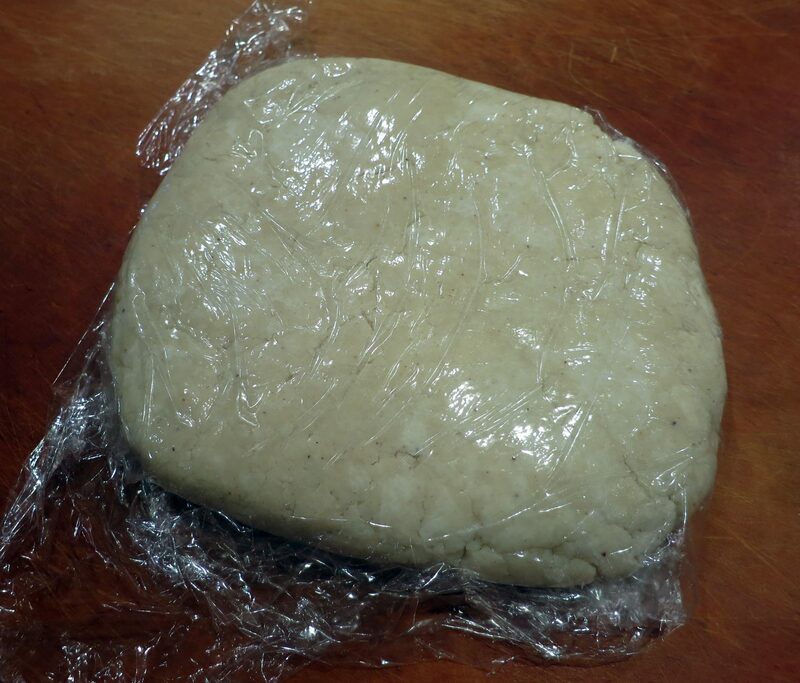 Turn out the dough onto a large piece of plastic wrap. 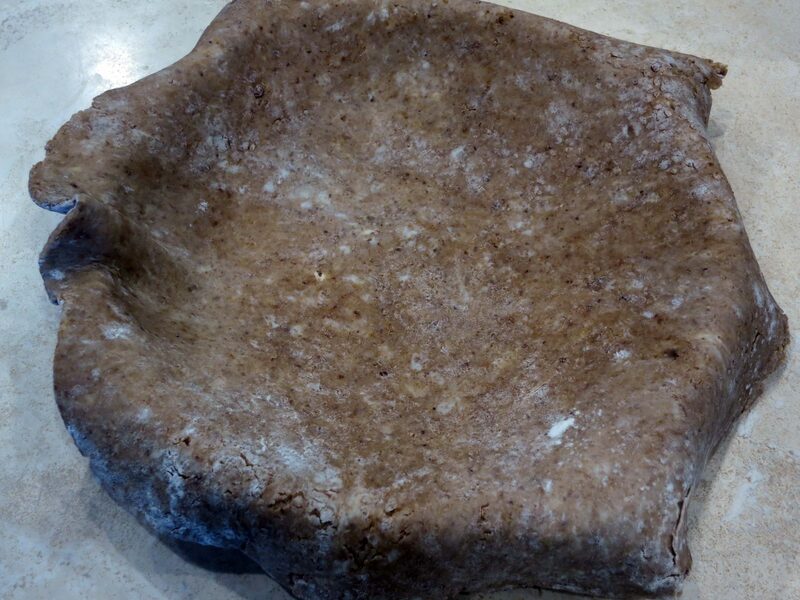 With your hands underneath the plastic wrap, fold over and forcibly pat down on the dough until it sticks together and forms a disk. Wrap up the disc and refrigerate for at least 4 hours, or overnight. 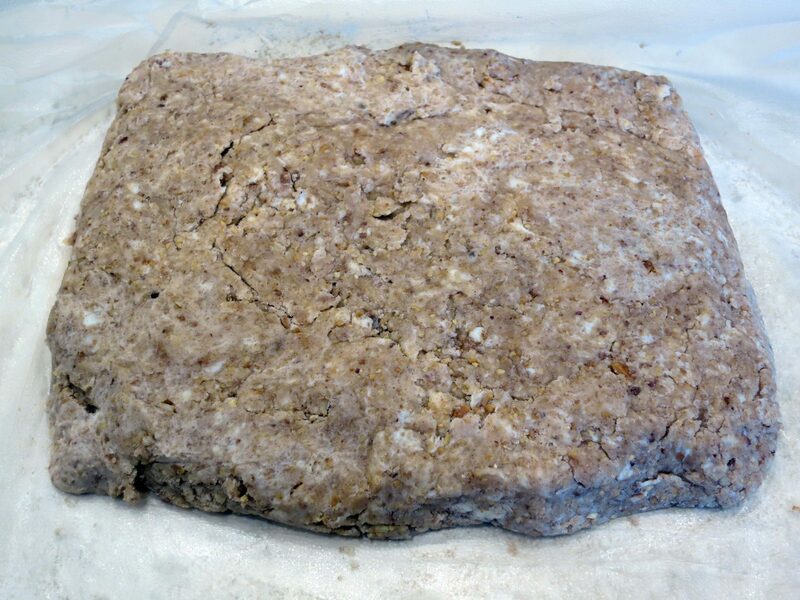 The next day, get the dough out of the refrigerator and let it sit a little bit to warm up slightly. You can alternatively try beating on it with your rolling pin. 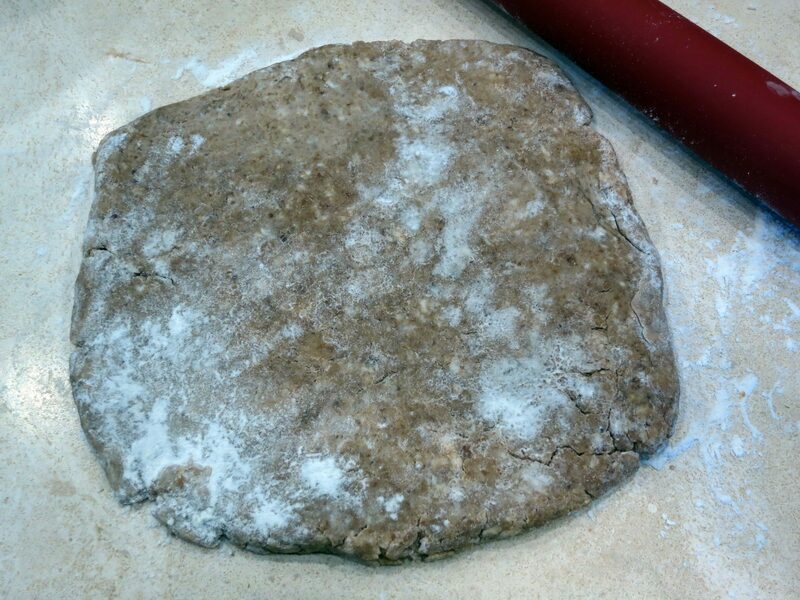 Unwrap the disk of dough and place it on a gently floured surface. Using the same technique as you would a pâte brisée, roll out the dough into a large circle, sprinkling a little flour as needed. To assist in placing the rolled out crust into the pie pan, use a very wide metal spatula. I would invest in one if you don’t already own one; I’ve used this a lot when a regular spatula just won’t do. Then carefully place it over the pie pan. 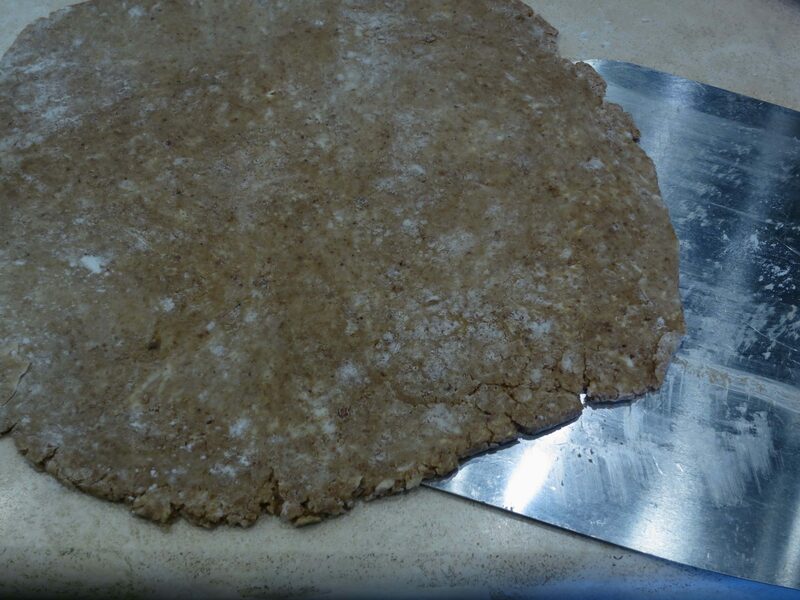 Trim the edges of the crust that overhang, and then crimp the edges carefully. 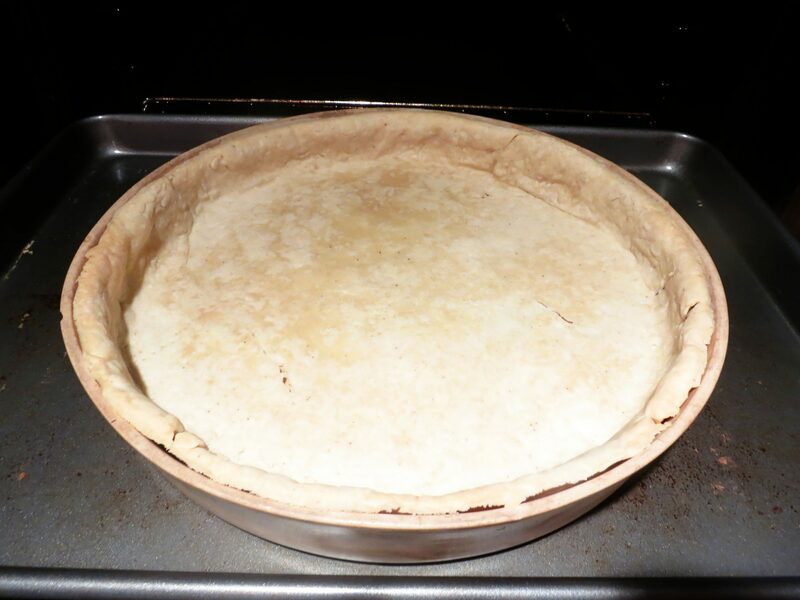 Place the pie crust in the refrigerator until you fill the pie. At that point, also place the pie pan in a jelly roll pan, or on a cookie sheet. That way you don’t wreck the integrity of the crimped crust grabbing the pie pan with oven mitts. There will be a future post on the eggnog ice cream I topped the pumpkin pie with that filled this fabulous hazelnut cinnamon crust pie!